I like pirates. The fictional kind, not the Somali ones. It’s partly my love of all things water-related, which includes my love of the ocean, and boats, and ships, and sailors…see where I’m going? I like pirates like Captain Jack Sparrow. Fictional heroes who turn to piracy for the adventure it brings and the chance to be free. A gentleman pirate, if you will. Or one like Jack. I recently read Under the Black Flag: The Romance and Reality of Life Among Pirates by David Cordingly. It’s a good read; it separates fact from fiction and brings examples with vivid stories of pirates, like Blackbeard. Unfortunately, it was written before Pirates of the Caribbean came out, which probably could have been a chapter in itself. Though the book does discuss Port Royal (a pirate hangout), which is in the movies. In any case, as I read through the first half of the book, I thought I had put my love affair with pirates to rest. True, as an impressionable teen, I couldn’t think of pirates without a wistful expression on my face. But I’ve grown up and matured. Reading the book, I realized that pirates were cruel, vicious, mean, brutal, and vile thugs. They raped and murdered, stole and tortured – not exactly knights in shining armor (who, by the by, also have a better reputation than they deserve). And then I got to the middle and, as is common in non-fiction books, there was a batch of shiny, thick pages with pictures. And when I saw that first pirate picture, a warm feeling welled up in me and I smiled. I finished the rest of the book, more or less, and I’ve come to a satisfying conclusion. It’s not world-shattering; it’s not even something new. I’ve just settled my feelings on pirates. Most of them were (and are) absolutely horrible. I say most, but I mean almost all. With like, maybe one exception. I’m not sure who the exception is, but there’s probably at least one. So pirates are bad. However, I’m perfectly okay with liking fictional ones. I’ve decided that this does not go against my principles. 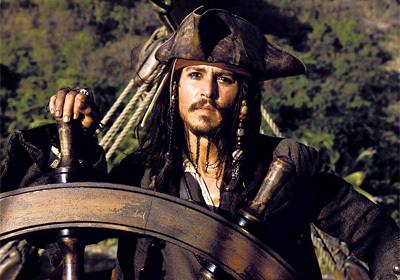 As long as the pirate is sailing the seven seas between the pages of a novel or in some Hollywood movie, it’s all good. I can root for him. That said, it’s important for people to realize that the fictionalized version is just that: fiction, and that real pirates are a far cry from their suave counterparts.